As a parent of 2, I cannot believe how much space is taken up by the all the strollers we own. Not any more! Enter this little gem. This stroller folds up so small and compact, and it barely takes up any space in the garage and/or truck of the car. Not to mention it's super lightweight which makes for easy transport. It also comes with a convenient carrying bag. The stroller easily fits into the bag without a big wrestling match. For such a compact stroller, I found it to be built well and it was very easy to assemble...just pop the wheels in, and you're ready to go! The wheels also have done great on dirt and rockier paths. I also really like the seat depth of this stroller. Other strollers I own have such a deep seat that both my kids actually scoot forward to be more upright. The shallower depth seems to be comfier for both kids. This is also the perfect stroller for any mom that is tall! I'm 5'11", and I don't have to hunch over at all! And the maneuverability is fantastic. It's so lightweight and easy to push that my 2-year-old can easily push it without assistance. Additional pros are the multiple reclining positions...my kid napped quiet well in this stroller. Especially since the foot rest kicks up for such occasions. The canopy is also great and provided great shade cover and extra protection. There are a few reasons I gave it 4 stars. First, the latch doesn't work on my stroller, so, unless it's in the carrying bag, I have to have two free hands to carry it around. I'm assuming this is a once-off defect, but when you're a busy parent, you simply don't have time to deal with issues like this. If this is a common issue, then this stroller is definitely not worth the money. Also, it claims you can fold and unfold with one hand, but I found this fairly difficult. I also found the buckles a bit tough to use. Lastly, I do wish it had a parent console. Honestly, the pros outweigh the cons, and I'll be getting rid of the other strollers we have taking up space in our garage because this stroll takes care of all the needs. Thanks to the weeSpring Parent Panel for letting test out this great stroller! I received this stroller from the weeSpring parent panel to test. It came the day before we left to travel Across the country. Love the one hand closing feature. Easy to maneuver and light weight! My little one is a very tall 2 year old and fit comfortably, sitting and laying down. I received this Jogging Stroller from the weeSpring Parent Panel. I was extremely impressed with how small it folds up as well as the ease of folding/unfolding the stroller. We normally keep our strollers in the garage when we are not using them, but this one takes up so little space that we are able to store it in our coat closet! This feature also makes it great for traveling and keeping in our car for extended errands or trips to the zoo, etc. I also love that it can recline almost flat - we had to have our 2 year old out during her nap time but were able to let her recline and sleep in the stroller without a problem. It also has a nice sized canopy for protection from the sun and/or to help provide a barrier while they are sleeping. Finally, the stroller is quite easy to maneuver. My 6 year old son had no problem handling the stroller while pushing his sister through a crowd. All that said, the stroller is not the smoothest ride on bumpier roads and the wheels seem to rattle somewhat. I think it's best for sidewalks and indoors, rather than pavement. Overall, it's a great stroller for everyday tasks and travel. I definitely recommend it. 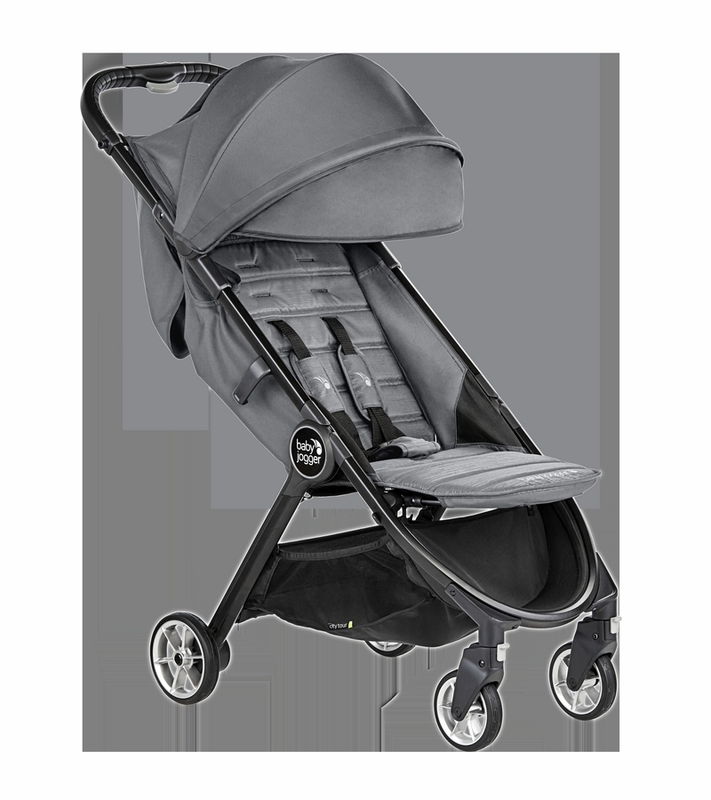 Overall, it is a great stroller for walks around the neighborhood and outings. This is the best stroller that I've ever had. It's incredibly stylish, compact, and easy to use, while remaining lightweight and maneuverable. It folds up in just two steps: push the button on the handle to fold the top down, then pull the strap in the middle to fold the bottom in. When folded, it's impressively small, about the size of a large messenger bag. The only thing I found lacking is cup holders or a place to set my phone/keys - but I understand the omission given the compact size, and there's a small storage area underneath the seat. I highly recommend this stroller to anyone looking for something for travel or day trips. 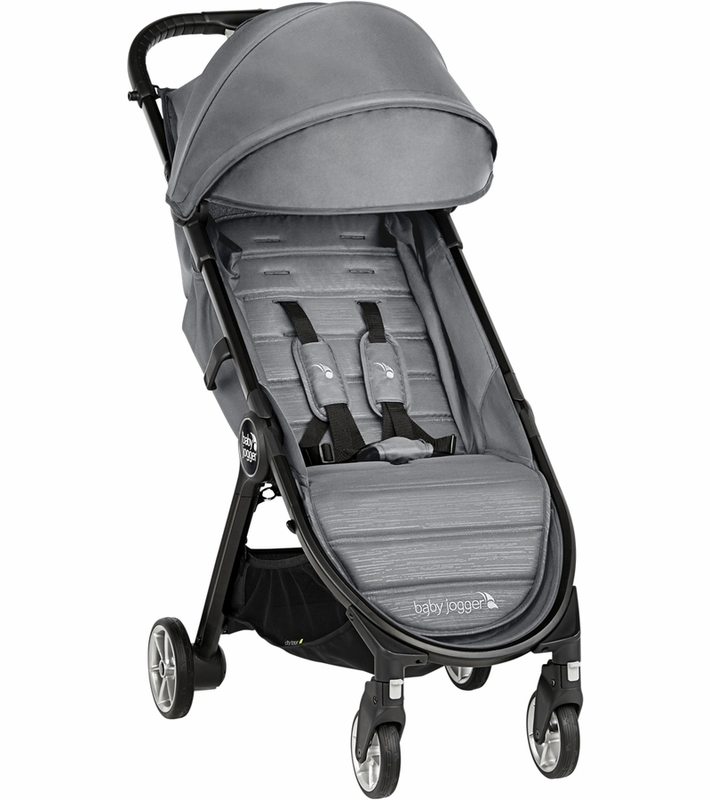 It's the perfect hybrid of a jogger travel system and a small umbrella stroller. I received this stroller as part of the WeeSpring Parent Panel. This stroller is fantastic. The design is great. It's not bulky and very easy to maneuver. I've been using (well actually it's been collecting dust in my garage) another stroller that is very heavy, bulky, and hard to transport. This stroller is the opposite of all of that. It's not a hassle to fold it up, put it in the bag, and carry it along where it goes. The folding feature is super easy to use. My 18-month-old loves riding in this stroller and I see us using it for a good while. The only reason why this review is not 5 stars is because I think the stroller is slightly pricy. **I received this product for free through weeSpring Parent Panel in exchange for my open and honest review. I would like to start off by saying that I was so surprised by how small and light the box was for this stroller. Most strollers that I have used or purchased were heavy, bulky and were quite annoying to put together. This was put together in a couple VERY easy steps. Clip the wheels in and we were off and ready to go. Everything about this stroller is great. It fit in my car easily, was easy to fold and it is so smooth while turning. I was able to fold the stroller down with one hand which is a huge plus with a busy toddler on my hip. My son wouldn't leave the stroller and wanted to stay in it past our walk time. It must have been comfortable because he fell asleep in it once we were at our house. That doesn't usually happen with him. He's wired after a walk! My only complaints are very minimal. If I could give it 4.5 stars out of 5, that's what it would be. When pulling the stroller out it tends to unfold without me releasing the clasp and then it is hard to actually set up to put the baby in again. I am sure this might get easier with time and use but for me it takes a few seconds to put up. My only other problem is it easily gets caught on uneven surfaces. There aren't many around here but on one part of the sidewalk it was about 1 inch higher than the ground I was on and the tires got stuck. All in all, a great stroller. Easy to use, very lightweight, very comfortable AND has UV protection. I absolutely love how small and compact the stroller is. This will be great for traveling over the summer. I would like to add that I received this from weeSpring Parent Panel but my opinions are my own. Talk about a smooth ride! This stroller is fantastic through and through. 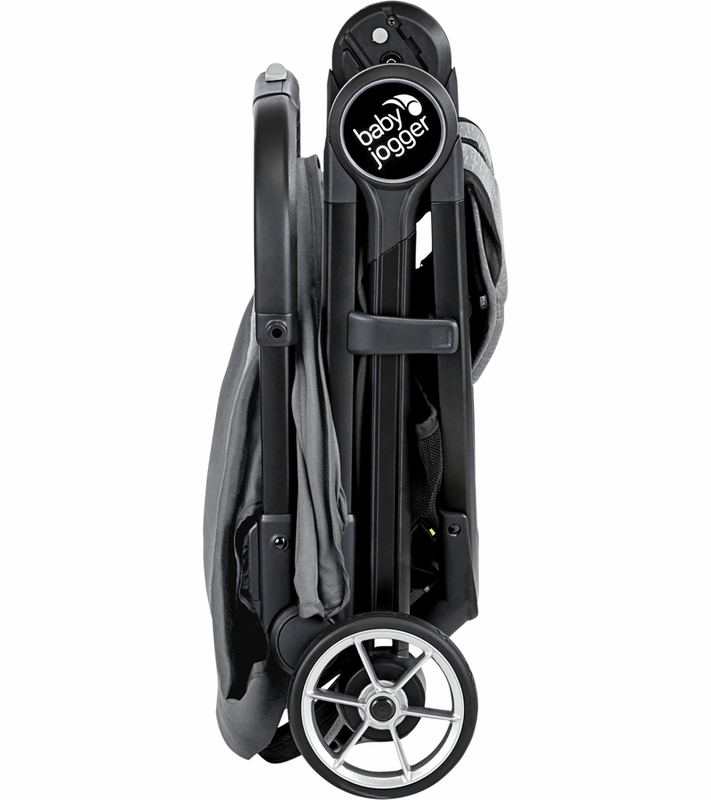 The design, weight, maneuverability, and sleek look of the City Tour 2 are all amazing aspects of this new stroller. My husband loves that it fits into a bag, and we can keep it in the back of our vehicles so we're always prepared, and it doesn't take up much space! I am so impressed by how smooth this stroller rides and steers, it's truly an all around gem. This is perfect for travel and when we're out and about - as a mom who often runs errands alone, I appreciate the feature and ease of folding and unfolding it with one hand! The versatility and durability of this stroller make it second to none in our book. I've recommended Baby Jogger strollers to my sister in law, she went and tried one, bought one, and she loves her as well! I received this stroller to test and review as a part of the weeSpring parent panel. Great compact stroller, easy to fold and store! I received the Baby Jogger City Tour 2 stroller as part of the weeSpring parent panel. I had been searching far and wide for the perfect compact stroller, needed specifically for travel, and the City Tour 2 did not disappoint! It was easy assembly and folds easily, with one hand if need be! It comes with a travel case (with strap) and folds to the size of a carry-on suitcase. I love that it reclines to a near flat position - for when baby needs a nap on-the-go, and the canopy provides full sun coverage an protection. The only reason I deducted a star is because I'd love to have a cup holder - for mommy's latte addiction :) and the wheels are a bit small for my taste. I feel like slightly larger wheels might help to absorb shock better, but I guess the smaller wheels is why its a perfect compact stroller! I've had two previous Jogging Strollers and both were heavy and cumbersome for travel. My family recently moved to Boston from a very suburban area and got rid of our previous strollers as they were just not going to cut it for apartment living and public transit. 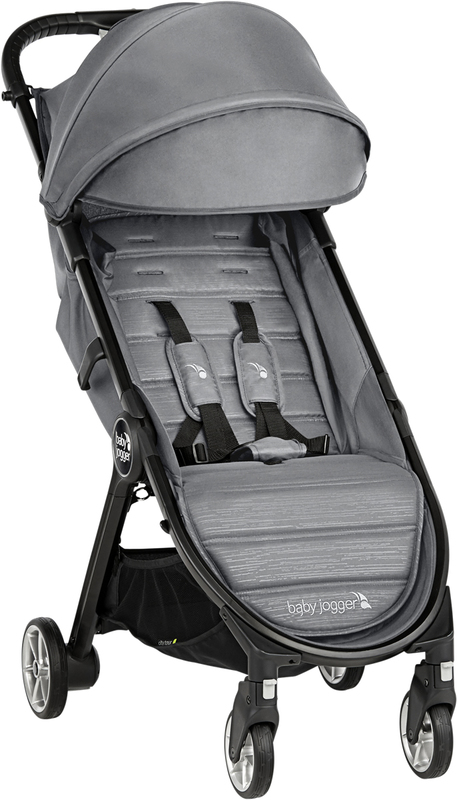 I was thrilled when I found out that I would get to try out the Baby Jogger City Tour 2. It is compact and lightweight yet glides so smoothly. In came in a very small box for a stroller, so I was skeptical about what we were getting. However, we unpacked it and my husband had it together in a matter of minutes. Folding and unfolding the stroller is incredibly easy! I can carry it with one hand and and I love the fact that it came with a storage bag for travel. It fits its bag neatly and now is stored in the cargo area of the car. It takes up very little space and is quick to pull out and get my 2 year old in (if he's cooperating!) He was very excited about the new stroller and seemed to be comfortable. It's nice that the foot/leg support is adjustable and that he fit without issue with all his winter gear on. Living in a big city involves public transportation: buses, trains, subways. This stroller folds up quickly and takes up very little room when riding on the train. This saves time and annoyance for your fellow passengers. This is a major plus in an urban area. There were two things I didn't like that brought the rating down: 1) The seat back stops at his shoulders. Since it doesn't extend up behind his head, falling asleep in this stroller seems like it wouldn't be very comfortable. 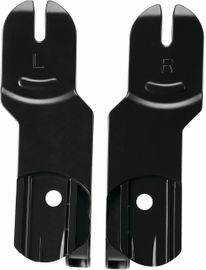 2) The latch that holds the stroller together when collapsed doesn't sit tightly. My husband even removed it and reattached to try and get a better fit. It helped but was still not tight enough. This is something they should improve in future models. Overall, we are thrilled with this stroller! Thank you weeSpring Parent Panel for giving us this stroller in exchange for our feedback, it's a welcome addition for our travel! The Graco Baby Jogger City Tour 2 has me conflicted. While I really loved it in some situations, I really disliked it in others. As a simple, minimalist stroller, the quick and easy, compact fold was a HUGE plus. Especially for someone that has a small car, this will fit. Even a VW Beetle. It's as small as a carry-on, which is a wonderous feat. It also easily and quickly opens. It's lightweight and easy to push around. I LOVE that the footrest folds up. My child is thrilled to be able to put up his feet and have more space to play with toys or place his snacks. I love that you could push this stroller one-handed. What I wasn't so thrilled about is that there was very little storage. I think it's way too small. I couldn't even fit my diaper bag in it, which was a big bummer. There was barely room for a bottle, snacks, a toy or two, and baby's jacket. It's not very practical for you're going on an adventure (think zoo or a museum), but if you're just going quickly into the grocery store or the bank, this stroller will be amazing. I have two children, so I need a bigger underseat storage than this stroller has. All-in-all, I do enjoy this stroller. I use it a lot for simple errands, walking around the mall for exercise, going to the park, etc. If that's all you need, then this stroller is a slam dunk. Thank you weeSpring Parent Panel for the opportunity to review this stroller. Thanks to weeSpring parent panel for allowing me to try this awesome jogger. To say I was pleasantly surprised would be an understatement. Let me start this by saying once I opened the stroller, my daughter made everyone in the house push her around for hours. She has only ever liked one of our strollers so to see her love this immediately made me so happy and relieved for furtue outings. Our first trip out she fell asleep and didn't try to escape even once! I love how compact it becomes for the trunk and it's super easy to open and collapse. The under storage is a great size and it reclines easily. I'd recommend this to anyone in search of a very smooth,compact and just overall great on-the-go jogger. I have been using all kinds of different strollers since my daughter was born. Joggers, multi-use and umbrellas strollers alike. I find strollers to be an essential item when traveling around with kids but each serves their own purpose. I always thought umbrella strollers were the only option for travel or a quick trip to the playground or a restaurant since they are lightweight and compact. When I received the Baby Jogger Graco City Tour 2 my idea of a lightweight travel stroller changed. This stroller seems even more compact than a regular umbrella stroller. It fits in a small corner of my entryway, taking up less space than an umbrella stroller. It is also very light and has a large canopy to shield baby from the sun. These features are great but I don't like that velcro is used to hold the little viewing window on the canopy closed. If the baby is sleeping and I open the window it will make a loud noise. It also took me a while to get the hang of opening and closing the stroller properly. Although frustrating, I eventually got the hang of it and it became easier to handle. Steering this stroller is ok but not the best but I think that is due to its lightweight nature. Overall, I think my favorite feature of this stroller is how light and compact it is. I also love the large canopy which is very useful to shield baby from the sun. I plan to take this on my next trip. Thanks to the weeSpring Parent Panel for providing me with this stroller! I received this Jogging Stroller from the weeSpring Parent Panel. This is the first jogging stroller I have owned. Iin addition to this jogging stroller, I have a full size stroller and an umbrella stroller. This Graco jogging stroller is pretty awesome. I love how it is pretty lightweight and easy to open and close. It isn't as bulky and awkward as some other jogging strollers on the market. It maneuvers really well too, much better than the two other strollers I have. I will definitely reach for his stroller when doing outdoor activities at parks or other places where the terrain is uneven. My daughter is almost two and a half and seems very comfortable in this stroller, enough to nap in if, making it my favorite feature! This is a great stroller. We spent a long day at the zoo with my almost 5yo and 2 yo, who took turns riding in it and they loved it and we really enjoyed using it. It has been great around town and in stores. It pushes like a dream. The stroller has a very large canopy for a compact stroller which i love. The seat reclines quite far, but i do feel like it is a bit flimsy and there isn't too much padding but those are trade-offs for a lightweight, compact stroller, you won't get all the plushness of a full featured full size stroller anyway. The seat reclines easily, but your child must sit up or not be in it to put it back up (not unusual in umbrella-light strollers) The straps were pretty easy to adjust, but the straps are in 5 pieces, center crotch strap, then 2-shoulder and 2 lap belts that fit together in a buckle. On one side, the pieces kept sliding apart so we would have to put it back together each time we were strapping someone in (which at the zoo is often). The leg rest is very sturdy which is nice, i feel like it could stand up to kicking and antsy legs well. This stroller is so easy to maneuver. I really didn't notice much of a difference if my nearly 5yo was in it, or my 2 yo. You can easily push it with one hand, and the handle is comfortable. I will say that the handle is quite tall for a compact stroller.The parking break is easy to engage, but you do have to flip it up with your toes, so come summer, I'll have to be careful with sandals on. Over all, this is a super stroller for urban outings, keeping in your car (it folds up pretty small), and if you are limited on storage space. It has all you need, pushes extremely well, and looks great. I purchased this a few days ago to use for my international trip next month. I was a little hesitant because the folded size is still a bit bigger (by an inch or two) than most airlines' handcarry size. But I really wanted this travel stroller for the one-hand fold (I'm traveling alone with a toddler) and recline so I decided to get it anyway, and just gate check it if airlines won't let me take it onboard. And now that I've tried it, I love it! It's easy to fold, has good recline, has added seat depth, leg support, canopy, easy to maneuver, compact, comfortable, nice looking and seems sturdy. It's almost perfect, except, the lock doesn't work well. I have to put it on the floor and press to lock it, but it doesn't stay locked. I don't know if I got a defective product or it's just that way. And the lock only covers the two folds, not the handle of the stroller. So if someone grabs it by the handle bar instead of the intended strap, it opens up. I'll make sure to put it in a bag when I gate check it to prevent that. I wish the bag it came with is more compact and has structure too, it's nothing like the photo in their ad. Required two hands to unfold, the buttons to fold are a bit difficult to press and slide. Also, it doesn't self-stand. But despite the cons, I still think it's a great travel stroller. This stroller is perfect for Moms! It's lightweight, easy to fold up, and takes up such a little amount of space when folded. I'm always nervous about putting things together, but the whole family got in on this stroller set-up. The kids loved helping out and it only took maybe five minutes overall! There are some really neat features this stroller has that I wouldn't say are too common. To be honest, I'm not sure how I managed without them. The biggest plus is the adjustable calf support. My kids absolutely love it. It's basically a recliner! I'm also a big fan of the larger foot pedals for breaking and the easy/small stow-away. Have I mentioned how compact it gets? WOW. The only thing I didn't like is the seat is a bit narrow. My four year daughter isn't as comfortable in it as my two year old son. The buckles take some getting used to as well. This stroller is the PERFECT "on-the-go" stroller. It's got everything you need and nothing you don't. Thanks to the weeSpring Parent Panel for providing me with this product! I was given this Jogging Stroller to try as part of the weeSpring Parent Panel. The box that it came it was really compact so I was definitely excited to see how compact it was compared to previous travel stroller. Putting it together was a breeze. We had some issues with getting the stroller to fold and stay locked. Even after several use, we can't get it to stay locked. Not sure if it's something we're missing or not doing right. That aside we really like how easy it is to fold up and store away in our apartment and small car. The stroller is really smooth especially walking through some of the bumpy streets around our neighborhood. I love how compact the stroller feels. The sun cover covers our little person well and we love how far back it reclines. The downside is that we don't like the mechanism on how to recline and move up. Overall a good stroller for walks and everyday use. We haven't traveled with it yet but i imagine it would be an easy to travel with because it's lightweight and compact. When the stroller first arrived I got the box and was wondering where the rest was. I still can't believe how small it folds, amazing space saver!! It unfold and folds up so easily and the handle is a life saver. I was happily surprised at the size of the basket underneath too, there is a good amount of room. I tried this stroller with both my son (3) and my daughter (2) and they both enjoyed sitting in it. It was easy to adjust the straps and also the recline position. My top thing I look for with strollers is the sunshade and this ticked my boxes. With living in Florida I need a large shade to cover my kids eyes and it done the job well. Also the peek-a-boo area was a nice size and good feature. It manuevered really well and didn't need adjusting. I liked how the tires were not air filled so I didn't have to worry about that either. And I really liked the carry bag I could store it in for travelling or to store. This is ultimately an awesome stroller and I'd recommend it to anyone who needs a space savings stroller but also light weight. I'm excited to take it with me when I next fly long haul. Thanks to the weeSpring Parent Panel for providing me with this product. I received this stroller for free to test through the weeSpring Parent Panel. The features that I really like are the nice grip on the handle, the recline of the seat and the foot rest. My 2 1/2 year old is big and it supports him really well and he seemed very comfortable in it. The stroller maneuvers around very easily- my 4 year old was even able to push it around the house with the baby in it easily. 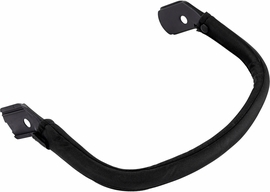 It folds very easy and is reasonably lightweight to carry with the handle. I was not able to easily fold it with one hand like the tag says, but it was easy enough to fold it up. It also comes with a convenient carry bag that worked well. The only part that was confusing for me was the buckle and how it hooks together. It is two pieces to each side and you have to slide the pieces together before you buckle it. I would prefer an easier buckle. Overall, this stroller is great and I would highly recommend it. Light weight and can be carried with one hand! Overall, this stroller is a much smaller footprint then my other City Mini GT Stroller but seems just as Heavy Duty. I love that it takes up less room in my trunk. It has a basket underneath with ample storage space. It is larger then a typical umbrella stroller but smaller then a standard stroller. It is light weight and easily carried with one hand! Folding was a bit tricky to master. You need two hands. So if you have to fold it while holding the baby, it will be hard. To close, you need to grip the lock on the handle folding forward while grabbing the handle at the seat and lift. The top folds opposite of the way you would think. As with anything, it just takes time to get used to. While I prefer the single wheel on front set up for one handed maneuverability, this stroller is compact enough to be able to use one hand if need be. My husband took it over some pot holes and up and down a few curbs and he said it handled well. My 14 month old was strapped in and the seat-back was set all the way up. She was able to lean forward and the entire back moved forward as well. It takes some time for the fabric to catch and stop her from leaning forward. I dont think she could lean so much that she would fall out. The stroller is super sturdy. The back reclines and there is a pop up for the feet for nap time. The only con: the clip to lock the child in, is 5 separate pieces. Add a scrambling toddler and it makes for a tough time. If you are looking for a smaller but heavy duty stroller, I would recommend the City Tour 2. Please note that I received this item as part of the weeSpring parent panel, however the review is all my own. I received this stroller as part of the weespring parent panel. Upon receiving the stroller I was amazing at how small it folded up in the box. The assembly was very quick and easy which I loved! 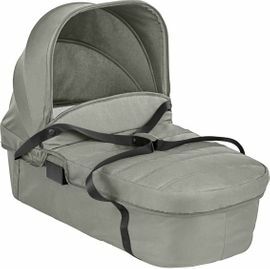 We took this on a recent trip with us and we loved how easy it was to maneuver, that my sons feet could be raised up and down, the peek window in the canopy, and the fast and easy folding ability. This stroller did lack a few items that are a must for me as a mom. There was no where for me to put items such as my cell phone, water bottle, or kids food by the handlebar. A quick pocket on the back of the stroller or cup holder by the handles would be helpful. The under storage was great but this could stand to be just a tad larger as it barely fit our diaper bag. The shoulder pads seemed to slide down as my son sat in them so inserting a material that helps them stay in place when moved to their correct location on the straps might seem to help. Overall I loved this stroller and adding those small items would make it amazing!! I would recommend this to a fellow mom!! I was looking for a lightweight stroller I could use with my toddler as I ran errands, walked to school to pick up big brother, take to the park etc. This stroller fits my needs perfectly. Features such as a large canopy, adjustable foot rest, adjustable seat position and five point harness ensures my little guy is comfortable and safe as he rides. Furthermore, it maneuvers easily and turns well. The wheels are not large but do well on concrete, sidewalks, and little bumps etc. For me, the best feature of the stroller is how it easily folds using one hand. Using the button on the handlebar, I can fold the stroller and put it in my car easily. As a mom of three, being able to get the stroller in and out of the car quickly and efficiently is a major plus. I've used several strollers over the years but this has become my go-to for every day use due to maneuverability, ease of folding and transporting, and my toddler being comfortable as he rides. I was given this product to try as part of the Wee Spring Parent Panel. one for flimsiness and one for cost. This stroller is perfect for my 2 year old. It folds up compactly. I love the carrying strap. I've taken it on long walks and short jaunts to the store. It's small but roomy. My daughter loves that the seat can lay practically flat. The basket underneath isnt huge but it fit my diaper bag. Overall it's a great compact srroller. It is now our "leave in the trunk" stroller for quick trips. I was given this product in exchange for my honest review. Thank you weespring parent panel for the opportunity to test out this stroller! I just purchased this stroller and let me tell you I've tried all the strollers under the sun and this is THE one light weight/ travel stroller I've been looking for. It's compact, has a sleek contemporary design, very light, easy to fold and unfold, maneuvers so easy...definitely can push with one hand, the feel is stable and solid and it has all the bells and whistles that matter. Like the leg rest is AMAZING! It's perfect for napping. I have a 3 year old and she LOVES that feature so much when she is tired. It's almost like she has a little bed especially because of the near flat recline. Also the basket is surprisingly big!! I fit my standard Azaria diaper bag under just fine and it's easy to access. For having such tiny wheels I was really impressed how this stroller handled a nice long walk on some light gravel on a paved road. It took it like a champ. The seat is also comfortable, the sunshade is very big. I also want to add that the seat back sits very upright which I love because unlike the Uppababy Minu which sits at a recline, my child loves being able to sit up and not leaned back. i should also add that my skinny 6 year old can also fit comfortably. Her head is above the seat back but she has plenty of head space because of the tall canopy, which I love because she still gets tired and can take a break in it when the youngest wants to walk. Also this accepts a bassinet or infant carrier, so this makes a wonderful travel system too!! This stroller is quality...from the fabric to the solid frame and grip handle bar, it's awesome!!! Lastly, the price point is on point! It's worth every penny!! So reasonably priced for what your getting! 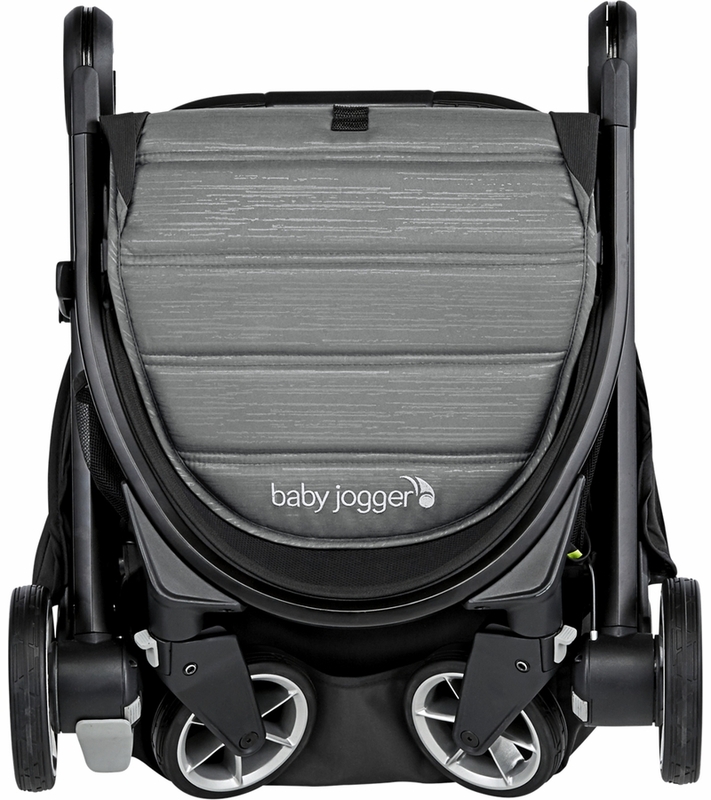 Anyway, I never write reviews, so I must say Baby Jogger, this one is a winner for me!! Great stroller, super happy with it and it deserved the time for a five star review. I hope this is helpful. Great stroller, but could be improved. I received this product for free as a part of the weeSpring parent panel. My review of the product is not influenced by this fact. We have the tried and true original graco stroller, the kind that comes with the infant car seat. That thing had seen a lot of miles and truthfully it was worn down and while it still had a lot of life in it, there were some features I didn't like about it. Primarily it was big, bulky, heavy, and it didn't steer well. Getting this stroller was a breath of fresh air, truthfully. The stroller is like, almost weightless. It's super lightweight which makes it easy to get it in and out of my SUV. I take the stroller with me almost everywhere because my daughter, like any two year old, is boiling over with energy. It makes it difficult to do simple things like visit the vet or the post office or get a hair cut without having some way to contain and entertain her for just a hot minute. It folds up nicely and the included storage bag is a nice touch, it's an easy way to tuck it away and not have it roll away or stolen by mischievous toddlers! This stroller steers beautifully! It was easy to control, even with one hand. It listens and cooperates, which I was worried about because that was a big problem I had with my other graco click stroller. It doesn't click, clack, whirr or thud like my other stroller did, and even when jogging or walking briskly, you're not going to have any trouble with it. My husband is 6'3" and found this stroller comfortable to use, just as I did at 5'3" which is a huge bonus! This stroller comes together in literally minutes. It's so easy to put together that my two year old did it for me once I showed her where to put the wheels. It took me longer to unbox it than it did to put it together. It does have a very chemical smell right out of the box but that dissipates very quickly and I think it's from the dye used on the fabric, so it's pretty harmless factory smells, haha. It seems to be comfortable, my daughter is pretty picky about strollers and has sometimes complained about our other stroller, but she doesn't make a peep in this one. She loves the little kick-out foot rest that lets her lie with her feet out. She likes it so much that she even put her pillow in it and lies in it to watch videos with her favorite blanket. The handle is rather uncomfortable, I liked the rubberized grip but it was just something about the angle of the handle itself that made it uncomfortable. The flat spot in the middle is claimed by the lever mechanism that allows you to fold up the stroller, so you either have to deal with uncomfortable grips or comfortable grip with an additional lever. There's nowhere to put anything. You have the small bin at the bottom under the seat, which is great, but you have nowhere for a bottle of water or powerade while you're out running. There's even a cheeky little message on the back of the canopy to not dangle or hang anything on the stroller! This is because they offer to sell you the drink holder as an attachment, which I feel is very money grabbing. I like the idea of being able to customize a stroller to the things I need or want, but at the very least, give me somewhere or something to put my keys in while I am out jogging, and I need a place for a water bottle! I could put both in the bin at the bottom, but that requires me to stop to fetch my drink and if I'm in the groove, that's a bit silly. The harness is a bit flimsey and the shoulder straps are a bit hard to connect with the waist straps. It kind of feels like Graco was trying to reinvent the wheel here, as they have this channel you're supposed to slide the clips into one another to make a whole piece and then click it into the button mechanism. I preferred the type that slide into one another, where a tab goes through an open box sort of clip. While on the topic of the harness, the button mechanism to undo the harness, well, my kid figured that out in 0.002 seconds. I can't tell you how many times I had to stop to buckle her back in. It's a giant round button that releases the harness with minimal amounts of pressure, the only way it could have been worse was if it was painted red with "Press Me!" on it. Sometimes the mechanism feels like it jams and you've got to fight it to get one of the two clips out of it. It's finnicky and I think it could have been designed a lot better. I do like how it matches the overall aesthetic, and is pretty slick and sleek looking. Overall, I think it's a great stroller with room for improvement, but a lot of my issues were personal preferences if anything else. I love this stroller! We bought this for the purpose of traveling. Itâ€™s a light weight, compact stroller thatâ€™s great for traveling or just â€œon-the-goâ€. 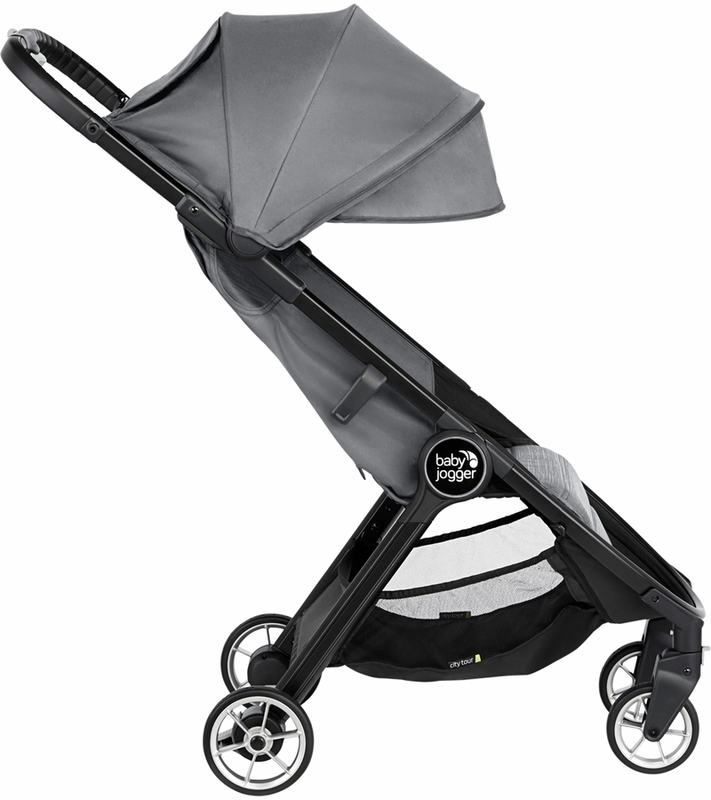 I have the Baby Jogger City Select and love that as my daily stroller. It also maneuvers really well, very smooth and I love the upgrade of having being able to insert a car seat/bassinet and love the fact there is a calf raise option. I love this brand and how it just feels so sturdy and so well made. ConsThe peek-a-boo screen to see through the canopy, I wish it was magnetic clips instead of Velcro. Does this have an adjustable handle? No it does not have an adjustable handlebar.